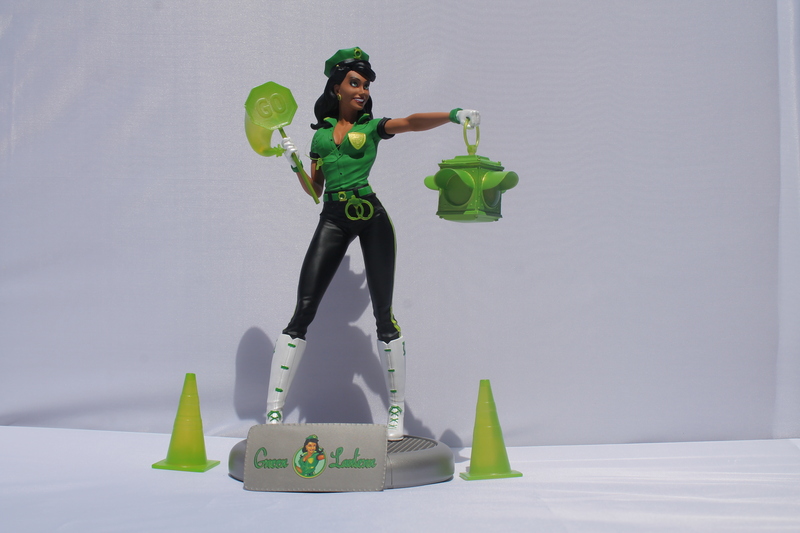 Thanks to the Jessica Cruz Green Lantern entry in DC Collectibles’ Bombshells statue line, traffic cops have never looked so good. Available right now, the roughly 11-inch-tall piece features the relatively new addition to the Green Lantern Corps directing cars with a traffic light-themed Power Battery and constructs like a “Go” sign, whistle, traffic cones and even handcuffs, in case some wise guy tries to get tough. Debuting in 2014 and created by Geoff Johns and Ethan Van Sciver, Cruz began her hero career with Power Ring’s Ring of Volthoom, but became an official space cop at the end of “The Darkseid War.” Since then she’s proved herself in the pages of Green Lanterns and Justice League. The Bombshells line kicked off three years before that, and has focused on creating retro-inspired takes on DC’s most iconic female characters, starting with Wonder Woman. The statue line has spawned everything from its own comic book series to action figures, and even playing cards. CBR caught up with DC Bombshells Art Director Brian Walters to get the inside scoop on bringing Cruz to life as a resin statue, along with a few looks at what could have been, in the way of preliminary design sketches of ideas that didn’t quite make the cut. CBR: What are the pluses and minuses of working on a piece like this, based on a character who hasn’t been around as long as someone like Wonder Woman? Brian Walters: Jessica Cruz was, I’ll be perfectly honest with you, the most challenging design that we have ever faced in this line, and we’re over 25 statues long. We were shocked that we hadn’t done a Green Lantern in the line in the first place. Jessica Cruz was all the rage when “Rebirth” started maybe a year-and-a-half, two years ago. So she was a primary character and we were ready to do a Green Lantern character at that time. That’s why she moved to the foreground, but her backstory is a little light. The blank canvas of that was kind of freeing in a way but also very challenging. So at the end of the day, because she didn’t really have a great backstory, we decided to harken back to the core qualities of the Green Lanterns, that they are space cops. And that’s what we used as the foundation of our design in the ’40s. Given the starting-from-scratch nature of this, how long did it take to figure out the general concept and nail down the design? A few months. This project was running behind because of it, but we wanted to make sure we got this right. We did a design earlier because Jessica Cruz tends to be a bit shy or reserved in the comic, so we were trying other costumes with a masquerade mask and her kind of peeking out from behind that. At the end of the day, we’re glad we landed on the traffic cop design because that speaks to what a Green Lantern is more than anything else, which is such a great place to start when you’re trying to pull things from the rockabilly culture and the ’40s to make this feel retro, but edgy and new all at the same time. It did take quite a bit of time to get this one to the place where we thought it was comparable and up to the standards of the Bombshells line. For the costume itself, were you pulling from any specific Green Lantern looks in addition to the overall ’40s aesthetic common to the Bombshells line? We had a number of Green Lantern costumes from Hal Jordan to Guy Gardner to Jessica Cruz, of course. So you start with the direct literal translation and then you can circle back and work in all those Easter eggs, design elements and fun facts like her Power Battery, which is a traffic signal. We wanted some literal translation for what her Power Battery would look like in the ’40s or ’50s. That was all super-fun to work on. We were totally looking at the comic costumes and figuring out how to reinvent them in this world. The post DC Art Director Details ‘Most Challenging Design’ in Bombshells Line appeared first on CBR.